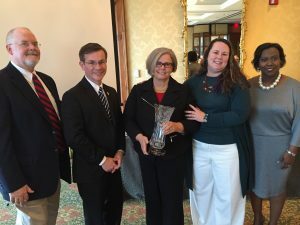 Nora Carr, chief of staff for Guilford County Schools, has been awarded the Barry Gaskins Outstanding Service Award by the North Carolina School Public Relations Association (NCSPRA). The award is named in memory of Pitt County Schools’ first public information officer and is the highest honor bestowed on an individual by NCSPRA. Carr received the recognition during NCSPRA’s Blue Ribbon Awards Brunch in Greensboro. Highly regarded for her experience in strategic planning, communications, and organizational development, Carr has dedicated most of her communications career to school public relations. Her expertise was requested following the deadly shootings at Columbine High School in 1999 and in 2013 to assist in Moore, Ok., after devastating tornadoes hit the area. Carr led communications and media relations efforts after both tragedies. She has won more than 200 state, local and national awards for communications excellence. In 2008, she was accepted into the Public Relations Society of America College of Fellows, an honor bestowed only on the nation’s leading public relations professionals. She also served as president of the National School Public Relations Association. Visit gcsnc.com for more information.